While designing your kitchen countertops and bathroom vanity tops, you will be asked to select a countertop finish. The finish will not only effect the aesthetics of the room, but will determine the resiliency of the material. Below are the pros and cons to each countertop finish. PROS: A polished finish is completely smooth and has a reflective “mirror shine.” Many countertop materials are available in a polished finish including granite, marble, quartzite, and man-made quartz. This finish brings countertop material to its most durable, as it helps to seal the pores found in natural stone. Sealing the pores helps to prevent staining, making polished marble much more resistant than honed marble. If you are interested in richly colored countertops, a polished finish is a good option. The process of polishing a stone deepens and enhances all colors. When compare to a honed version of the same material, it is noticeable that the honed stone appears more muted. Polished countertops compliment many different home decor styles from the more traditional to modern. If you have a Victorian or French-style kitchen, polished countertops will be in keeping with the detailed, elegant design of the cabinets, molding, light fixtures, etc. The glossy finish can also mix well with mid-century modern and transitional kitchens. CONS: While pros and cons are contingent on each person’s wants and needs, there are a few characteristics of a polished finish that some find undesirable. 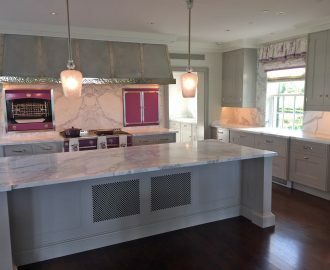 For some, a polished countertop can read cold-to-the-touch when compared to honed or antiqued countertops; It has even been referred to as “institutional.” This is a very personal tactile reaction that varies with each person. It is recommended that you experience each finish to find what feels right to you. As mentioned previously, a polished finish has a “mirror shine.” This means that you will see the reflection of your over-head lights, sunshine through your windows, and smudges. This is merely personal preference as to whether you may find it bothersome. PROS: A honed finish is completely smooth with a matte (no shine) surface. Just as smooth as a polish, the honed finish simply lacks the reflectiveness found in the polished finish. A honed finish is available in most countertop materials including granite, marble, quartzite, soupstone, slate, and most man-made quartz. If you are looking to add a splash of color with your countertop material but are hesitant in making a large statement, the honed finish may be your perfect match. As mentioned earlier, the honed finish gives all colors a more muted, soft effect. If you are color-reluctant, this finish can help ease you into a green or blue countertop. With its matte finish, a honed countertop can be a hit with those who are skeptical of seeing reflections on their countertop or smudges and fingerprints. 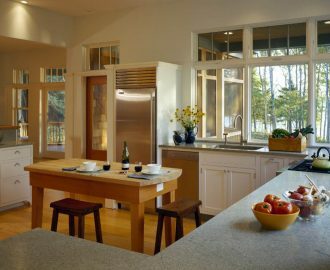 Additionally, many feel a honed countertop looks more modern than a polished countertop, preferring it in their contemporary, rustic, or industrial-style kitchens. The honed finish looks in place with any style that relies on more raw, unfinished elements. CONS: A honed finish has variable durability dependent on the stone type. Honed granite just slightly less durable and resistant to etching, staining, and scratching than polished granite. Comparatively, honed marble significantly decreases the resistance to damage, as even polished marble is lacking in durability. As always, it’s important to research the stone types that interest you to determine if they will compliment your lifestyle. Another preference-based disadvantage is the finish itself. Some feel the matte surface reads dull and lackluster, preferring the lustrous polished finish. PROS: An antiqued finish, also referred to as leathered or brushed, is a soft, slightly textured finish. Not all materials are available in an antiqued finish, though granite, quartzite and soapstone accept it. 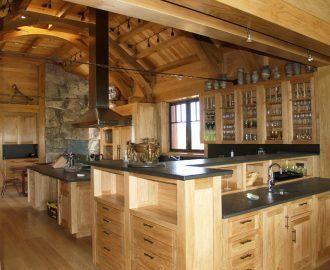 Choosing an antiqued countertop is an excellent choice for those who enjoy the feel of soapstone, but desire the hassle-free care of granite and quartzite. 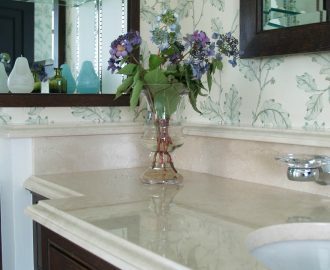 Antiqued granite and quartzite is going to be more scratch-resistant than soapstone, which scratches relatively easily. A preference-based advantage to the antiqued finish is, as previously mentioned, the soft, welcoming feel. Many people who find a polished finish “institutional” prefer the antique for its relaxed, casual quality. 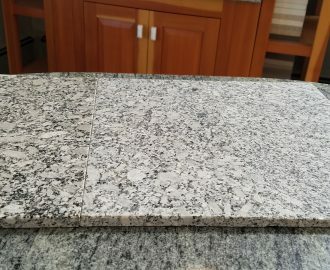 CONS: Similar to the honed finish, an antiqued finish causes granite and quartzite to be slightly less durable when compared to the polished version. 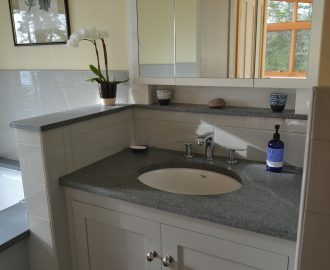 Soapstone with an antiqued finish is no less resistant to damage than its honed counterpart, as it is still easily scratched (though still impervious to heat and acids). When you are selecting a finish for your countertops or vanity tops, it is important to consider how high or low-traffic the room will be, the material type you will be using, and how much care you are willing to provide them.